December 2, 2017 by Dr. Randi Fredricks, Ph.D.
Eight-year-old Kevin McCallister (Macaulay Culkin) has become the man of the house, overnight! Accidentally left behind when his family rushes off on a Christmas vacation, Kevin gets busy decorating the house for the holidays. But he’s not decking the halls with tinsel and holly. 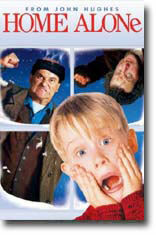 Two bumbling burglars are trying to break in, and Kevin’s rigging a bewildering battery of booby traps to welcome them. It is Christmas time and the McAllister family is preparing for a vacation in Paris, France. But the youngest in the family, Kevin, got into a scuffle with his older brother Buzz and was sent to his room which is on the third floor of his house. Then, the next morning, while the rest of the family was in a rush to make it to the airport on time, they completely forgot about Kevin who now has the house all to himself. Being home alone was fun for Kevin, having a pizza all to himself, jumping on his parents’ bed, and making a mess. Then, Kevin discovers about two burglars, Harry (Joe Pesci) and Marv (Daniel Stern), about to rob his house on Christmas Eve. Kevin acts quickly by wiring his own house with makeshift booby traps to stop the burglars and to bring them to justice. Kevin sets the house up with all sorts of tricks and traps, to out-maneuver these two clowns. Of course, the movie isn’t all about brash, goofy slapstick; there are some moving moments scattered throughout the film, such as when Kevin befriends an old man – who is feared throughout the neighborhood – who teaches Kevin a few things about life, as well as receiving a little bit of advice from young Kevin along the way. Character to watch: Macaulay Culkin as Kevin McCallister.